CENTENARY, Ohio — Lucky number seven. 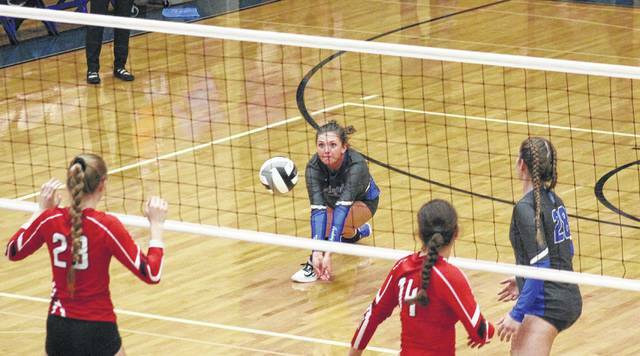 While the match may not have been in question, the Gallia Academy volleyball team faced back-to-back game-points for non-conference guest Jackson on Monday night in Gallia County. However, the Blue Angels scored four points in a row and prevailed in straight games, improving to a perfect 7-0 without dropping a game. The Blue Angels led wire-to-wire in the opening game of the night, winning by a 25-14 count with the final margin of 11 points as the largest lead of the game. Jackson scored the first five points of the second game, but Gallia Academy began chipping away at the lead and overtook the Ironladies at 10-9. GAHS never relinquished the advantage, rolling to a 25-16 win to move ahead 2-0 in the match. Gallia Academy led by as much as three points early in the third game, but the guests fought back to take the edge at 12-11. GAHS tied the game at 16, 18 and 19, but the Ironladies moved into a game-point situation at 24-22. With their backs against the wall, the hosts got the serve back to make the JHS lead 24-23. A Taylor Burnette ace tied the game at 24, and then the Blue Angels took a lead at 25-24. 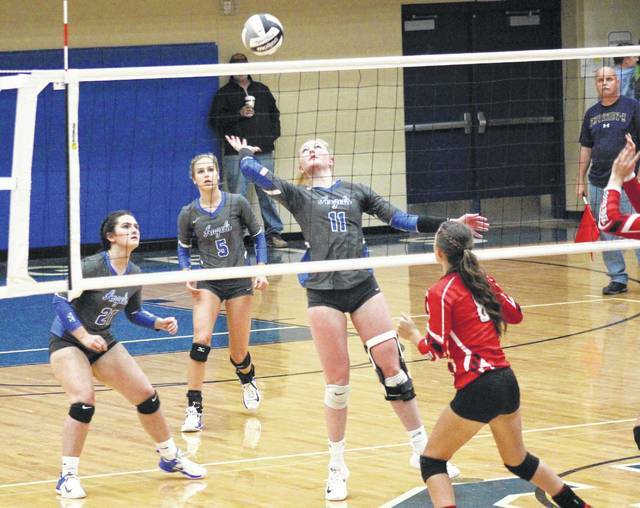 Burnette served up another ace as the Blue and White capped off the 3-0 sweep with a 26-24 win. The GAHS service attack was led by sophomore Alex Barnes with 10 points, and junior Ashton Webb with seven points and five aces. Burnette and Peri Martin both marked six service points, with three and two aces respectively. 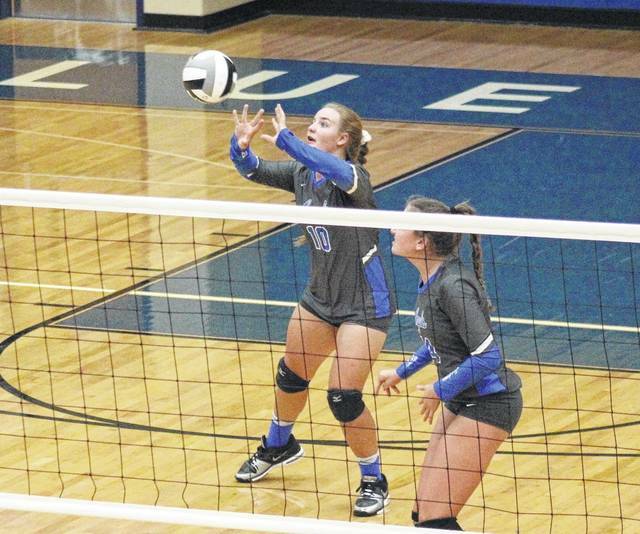 Hunter Copley contributed five points to the Blue Angel cause, Ryelee Sipple chipped in with four points, while Katie Carpenter had two points and one ace. 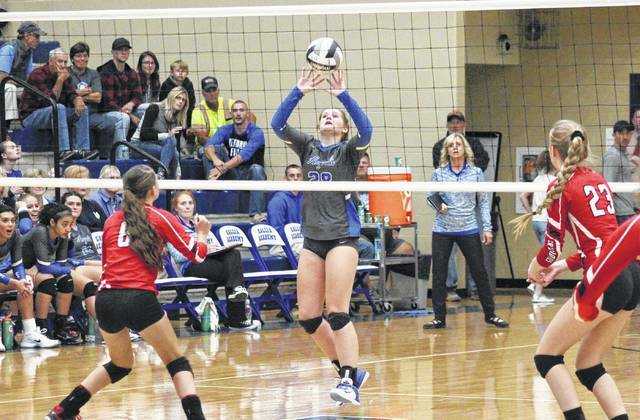 Webb posted a match-best 19 kills to go with two blocks and a team-high eight digs for Gallia Academy. Barnes had eight kills in the win, while Copley and Maddie Wright both added three kills, with two blocks by Wright. Martin finished with two kills, one block and a match-high 29 assists, while Aubrey Unroe posted one kill for the Blue and White. Melinda Ruggles led the Ironladies with eight service points. Jordan Banks and Olivia Carroll both had three points, Mariah Ridgeway added two, while Gracie Walburn, Abbey Munn and Abby Wood each marked one service point in the setback. This is the lone scheduled meeting between these non-conference rivals this fall. After hosting South Point on Tuesday, GAHS will head to Chesapeake on Thursday. Gallia Academy junior Aubrey Unroe hits the ball over the net, during the Blue Angels’ non-conference victory over Jackson on Monday in Centenary, Ohio.